Fills closed 2D areas with repeating patterns or solid colors; displays the Hatch and Gradient dialog box. Note: 3D entities cannot be hatched. Choose options, and then click OK. This option is unavailable for the User-defined pattern. 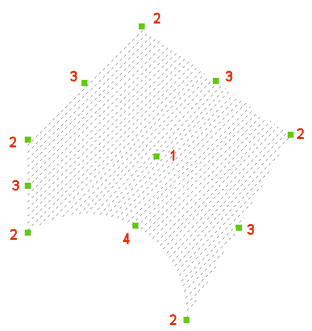 The scale factor of hatch patterns is generally the same as that for text and linetypes. This angle is measured relative to the positive x-axis of the current UCS. Use Current - uses the current color specified by the CeColor variable. None - uses no color. Use this option to begin the hatch pattern at the corner of a wall or other location where the placement of the pattern is critical. Uses the drawing's origin (0,0) as the origin of the hatch pattern. This option is available for only the specified (user defined) origin. You cannot pick an area that already contains a hatch pattern, or areas that are not closed (whose gap is larger than the value specified by Boundary Tolerance). This option allows you to hatch closed areas, including ones that already contain a hatch. It hatches open areas whose gap is less than the value specified by Boundary Tolerance. The value is saved in the HPGAPTOL system variable. Select entities - select more entities, or else press Enter to return to the dialog box. The next step is to click the Pick Points in Boundaries button to choose the hatch area. When a closed hatch boundary contains other boundaries, BricsCAD hatches alternating areas. When a closed hatch boundary contains other boundaries, BricsCAD hatches only the outermost area. When a closed hatch boundary contains other boundaries, BricsCAD hatches all interior areas, as if they were not present. Toggles the associativity of hatch patterns: when the boundary is changed, the pattern automatically updates itself. This option is not available for annotative hatches. Specify value - type a value or use the slider to set a value between 0 (fully opaque) and 90. The transparency level is limited to 90% to avoid confusion with layers that are frozen or turned off. The transparency value for new hatches is saved by the HPTRANSPARENCY system variable. This button is useful for quickly setting options of a new hatch based on existing hatches. Notice that it has one central grip (1), grips on each boundary vertex (2) and grips in the midpoint of each boundary segment (3 and 4). Drag the central grip (1) to move the hatch. Drag a vertex grip (2) or a midpoint grip (3 and 4) to change the hatch boundary. Gradient - places a gradient fill through a dialog box. -Hatch - places hatch patterns through the command bar. HatchEdit - edits hatches and gradient fills in a dialog box. -HatchEdit - edits the boundaries of hatch and gradient entities; displays prompts in the command bar. HatchGenerateBoundary - generates a boundary around a hatch or gradient fill. Properties - changes the properties of hatch patterns. 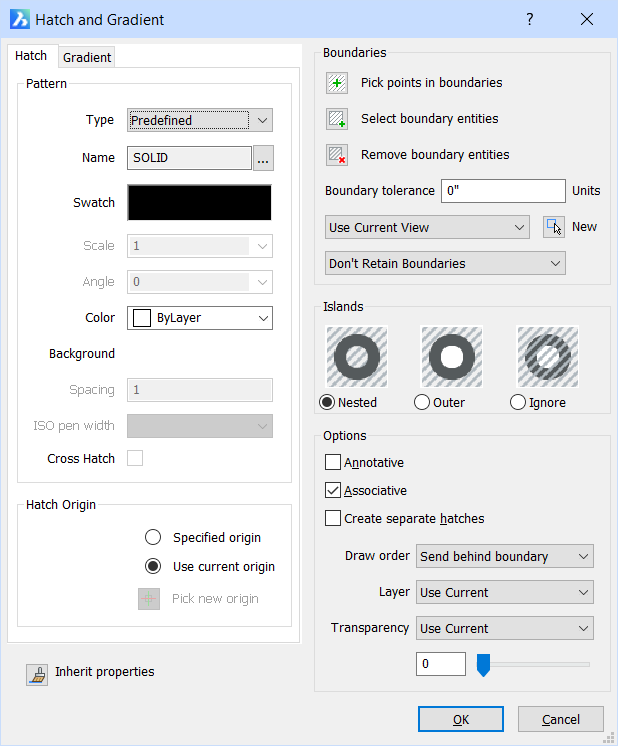 Settings - specifies the default parameters for hatch patterns. Solid - draws 3- and 4-side solid-filled areas.